The importance of developing early literacy skills is undeniable. Study after study has shown that children who enter school with strong early literacy skills are more likely to succeed, while those who lack literacy skills will struggle to keep up throughout their school careers. Children from low socioeconomic status (SES) homes often lack access to all 3 of these advantages. The result is a vast word gap: By the age of 3, children from low SES homes will have heard approximately 30 million fewer words than their peers from higher SES homes. Dr. Dipesh Navsaria, an assistant professor at the University of Wisconsin School of Medicine and Public Health and a practicing pediatrician, sees developing early literacy skills as essential not just for preparing children for school but for ensuring their lifelong health and well-being. 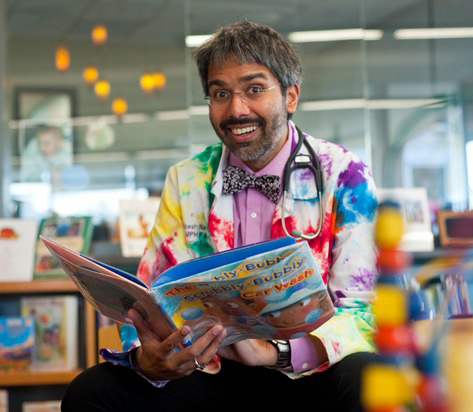 Through Reach Out and Read Wisconsin, Dr. Navsaria is using well-child visits as an opportunity to provide children with books and to encourage parents to become active in their children’s early literacy learning. Dr. Navsaria spoke with Upstart editor Lisa Bintrim about why the first 1,000 days of a child’s development are so crucial and how Reach Out and Read is seeking to ensure that all children are raised as healthy readers. Contact or learn more about Dr. Dipesh Navsaria.